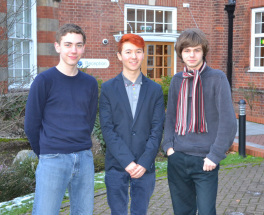 Many congratulations to sixth form pupils Daniel Shao, Joshua Hagley, and Michael Hope, who have been offered places to study music at Oxford University from September 2013. Joshua Hagley and Daniel Shao have been offered places at St. Catherine’s College and Michael Hope has been offered a choral scholarship to Magdalen College. All three pupils are studying at The Purcell School on a UK Government Music and Dance Scheme Scholarship. This scheme funds 85% of pupils at The Purcell School which, along with its own scholarship funds, ensures that all pupils join the School on the strength of their musical potential irrespective of their parents’ ability to pay.